Stocks rose sharply last week, as investors welcomed a strong February payrolls report and were relieved that wage growth moderated. Wall Street was also pleased that North Korea has stated it is willing to conditionally denuclearize and that President Trump had accepted Kim Jung Un’s invitation to meet in May. Investors were also relieved that President Trump exempted Canada and Mexico from his signed order to impose a 25% tariff on imported steel and 10% on aluminum imports, effective March 23. Commerce officials said 313,000 new jobs were added in February, surpassing projections for 200,000, while revisions for the prior two months showed the economy created an additional 54,000 jobs. Separate data showed the unemployment rate held steady at 17-year low of 4.1%. For the week, the S&P 500 advanced +3.25%, the Dow Industrials gained +3.59% and the MSCI EAFE (developed international) rose +1.86%. As previously mentioned, a stronger than expected 313,000 jobs were added to the U.S. economy in February, ahead of the consensus expectation for 200,000 jobs and the 12-month average of 190,000 jobs. 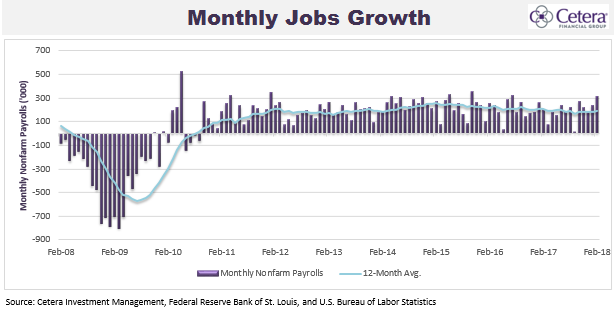 February’s jobs growth was the highest in 18 months, and the prior two months were upwardly revised by 54,000. Moreover, as Chart 1 illustrates, non-farm payrolls have increased for 89 consecutive months, the longest on record. Despite the strength in jobs growth in recent months, the unemployment rate held steady at 4.1% for the fifth consecutive month, largely because the labor force participation rate ticked up to 63.0% from 62.7%. One disappointment in February’s jobs data was the weaker than expected wage growth figure, which slowed down to 2.6% in February from 2.8% in January. Wage growth has remained stubbornly low during this recovery because of automation, changes in labor force demographics and low labor force participation. We anticipate that wage growth will rise as the labor force participation rate increases from near-historic lows. We believe there is still some slack in the labor market that could be absorbed before job growth begins in earnest. Overall, the jobs data in February was strong despite lower than expected wage growth figures.